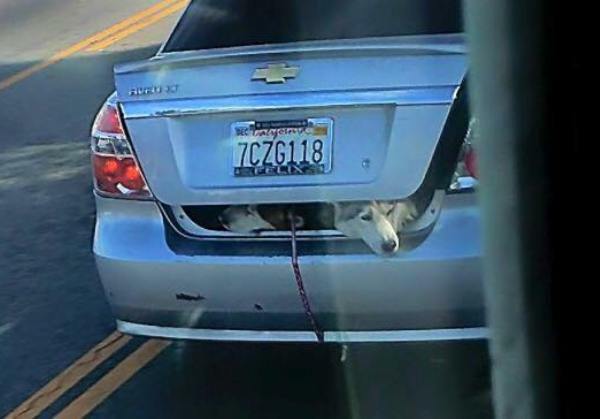 A driver in South Los Angeles was shocked by what he saw Monday in the car ahead of him: Two Huskies poking their heads out of the partially open trunk. A cellphone video and photos the driver took and posted on social media got the attention of local media. When contacted by CBS Los Angeles, the unidentified dog owner said she put the Huskies in the trunk because her children were in the backseat. Besides, she was only driving a short distance, so why not? Believe it or not, the dogs’ owner committed no crime. The Huskies’ owner used a bungee cord to prevent the trunk door from flying open. Still, the incident is under investigation by the ASPCA and the LAPD Animal Cruelty Task Force, but representatives from both said it’s unlikely the dogs’ owner will face any charges. “I believe it’s dangerous to have two dogs back there,” Dr. Richard Polsky, an animal behavior expert, told CBS Los Angeles, and I agree with him (as does the driver who took the photos and the dozens of people who commented on them). However, Polsky cautioned against jumping to conclusions that this was a case of animal abuse. “We have to get more facts, you have to get more knowledge about the circumstances in the background of these dogs,” he said. I would like more knowledge about the background of their owner, who put her dogs in an unsafe, albeit legal, situation. Did she really only do this one time, for a short trip? The dogs appear to be very calm — as if they were used to this strange mode of transportation. The LAPD Animal Cruelty Task Force told ABC7‘s Marc Cota-Robles it is not recommended to drive with your dog in the truck (duh! ), and it could be considered a sign of animal neglect. But since it’s actually legal, the most the Huskies’ owner will get is a warning. To save the lives of dogs, it’s time to change California vehicle code 23117 and make the transportation of dogs in trunks, with or without bungee cords, against the law. Loser Who Killed Dog with Firecracker Charged with… Property Damage?